We discuss the calculation of the leading hadronic vacuum polarization in lattice QCD. 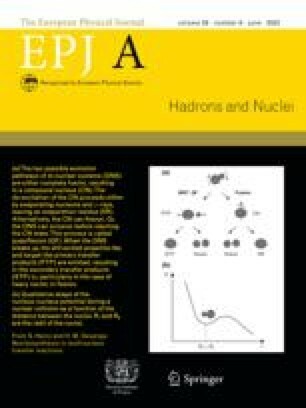 Exploiting the excellent quality of the compiled experimental data for the e + e − → hadrons cross-section, we predict the outcome of large-volume lattice calculations at the physical pion mass, and design computational strategies for the lattice to have an impact on important phenomenological quantities such as the leading hadronic contribution to (g − 2) μ and the running of the electromagnetic coupling constant. First, the R(s) ratio can be calculated directly on the lattice in the threshold region, and we provide the formulae to do so with twisted boundary conditions. Second, the current correlator projected onto zero spatial momentum, in a Euclidean time interval where it can be calculated accurately, provides a potentially critical test of the experimental R(s) ratio in the region that is most relevant for (g − 2) μ . This observation can also be turned around: the vector correlator at intermediate distances can be used to determine the lattice spacing in fm, and we make a concrete proposal in this direction. Finally, we quantify the finite-size effects on the current correlator coming from low-energy two-pion states and provide a general parametrization of the vacuum polarization on the torus. X. Feng, K. Jansen, M. Petschlies, D.B. Renner, Two-flavor QCD correction to lepton magnetic moments at leading-order in the electromagnetic coupling, arXiv:1103.4818. M. Della Morte, B. Jager, A. Juttner, H. Wittig, The leading hadronic vacuum polarisation on the lattice, arXiv:1011.5793. G.M. de Divitiis, N. Tantalo, Non leptonic two-body decay amplitudes from finite volume calculations, arXiv:hep-lat/0409154. B.B. Brandt, S. Capitani, D. Djukanovic, G. von Hippel, B. Jager, Wilson fermions at fine lattice spacings: scale setting, pion form factors and (g − 2)μ, PoS LAT2010, 164 (2010), arXiv:1010.2390. K. Hagiwara, R. Liao, A. Martin, D. Nomura, T. Teubner, (g − 2)μ and (α 22) re-evaluated using new precise data, arXiv:1105.3149. H.B. Meyer, Transport Properties of the Quark-Gluon Plasma -- A Lattice QCD Perspective, arXiv:1104.3708. R. Baier, R-charge thermodynamical spectral sum rule in N=4 Yang-Mills theory, arXiv:0910.3862.